3GEngagement is among a select group of advertising and marketing agencies that have been invited to Google Headquarters on August 13th and 14th in Mountain View, California for a two-day, invite only, training with Google experts. This exclusive trip is paid by Google, airfare and hotel for both David and I. We are very honored to be invited to Google Headquarters for the 2013 Google Engage All-Stars Summit where we will have exclusive training with Google experts, participate in thought leadership seminars, beta product demos, networking opportunities, marketing and product training sessions along with exclusive marketing materials. David and I are really looking forward to learning a lot so we can bring home new strategies and ways to help our clients continue to dominate online. Besides handling digital marketing budgets for dealerships all across the country, we also work very closely with a couple of OEM’s training both their field staff and their dealers on how to be better Internet marketers so this summit will really add a lot the next time we speak at one of the OEM workshops. Getting an inside look will just further add value to what we offer our clients. We will also have a face to face, one-on-one consultation with Google along with enjoying the different networking events and dinner with a Google keynote speaker from the event. But for those of you that know me, you know that I’m really looking forward to the Google Schwag! 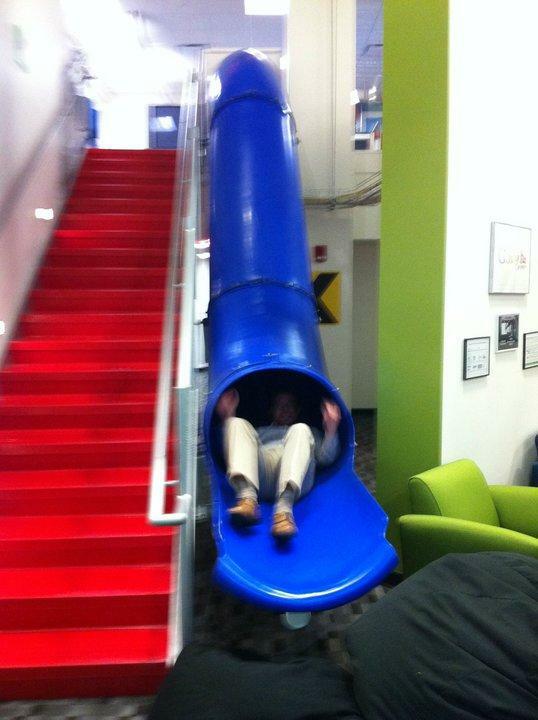 ……..and hitting the slide like I did when I was invited to their automotive office in Birmingham.